Marin designed the new Alpine Trail to handle the roughest and steepest trails with ease. If you love fast single-track, all-day long alpine adventures, and gravity-fueled downhills, the Alpine Trail is the bike for you. As latest incarnation of Marin’s critically acclaimed Multi-Trac suspension platform, the Alpine Trail is ready to conquer any trail you point it down. Features including the slack head-tube angle and aggressive 29” wheels, make the Alpine Trail a single-track destroying machine. 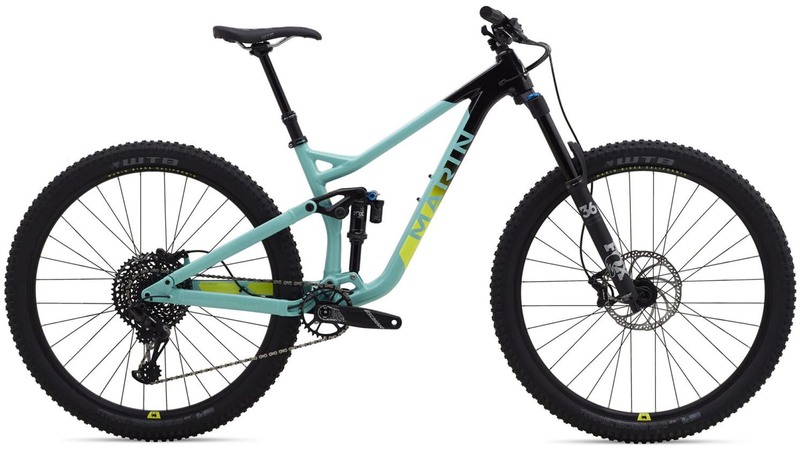 The Alpine Trail 8 is an incredible bike coming in at a great price. A 160mm Fox 36 Performance fork and Fox Float DPX2 rear shock provide a supple and smooth ride, the SRAM NX Eagle 1x12 drivetrain provides all the gears you need to make it up the steepest climbs, and Tektro Slate T4 hydraulic disc brakes provide incredible stopping power when descending those steep chutes. The bike is rounded out with Marin Tubeless Ready wheels for less flats and more traction. If you are looking for a bike that can handle everything the trail has to offer, the Marin Alpine Trail needs to be your next ride. From fast flowy single track to steep rocky chutes and everything in between, the Alpine Trail was designed to handle it all. Push your riding further and attack the trail with more confidence than ever before. Bike Radar - " From only a short time on the bike, it seems to me that Marin has created a pretty adept big wheeler that ticks all the boxes. It’s a good sign when you can rip bike park turns in the morning and head off on a high-altitude epic in the afternoon, all without changing a setting." Enduro Mag - "If you’re looking for a fun 29er enduro bike at a fair price, you should take a closer look at the Marin Alpine Trail. With its very balanced geometry and the mostly good spec, the Alpine Trail is a sound basis for a loyal companion for everything from long rides, bike park visits and enduro races." iMB Mag - " A fine example of how modern trends, geometry and equipment can be combined into an affordable package. A bike capable of being ridden out of the shop and onto a chairlift with no problems." 5'3" - 5'6" 5'6" - 5'10" 5'10"-6'2" 6'2"-6'4"